'Thunder Cove' and its 5 bedrooms can accommodate just about any group or event. Located on the 8MM of the lake, and by land you're within minutes of shopping and great restaurants. This recently built home offers an amazing 5 bedrooms, one of which is a bunkroom for the kids. Enjoy fishing and swimming in this large deep water cove, with an incredible view of the lake. Ease into the water by taking a few steps from house to your private dock. Enjoy the brand new private concrete dock. This is a beautiful concrete dock with extra large swim and sunbathing platform with a high dive platform and a large water slide. Also in the water is a 12' large floating tube for everyone to enjoy. The kids will spend hours playing on and swimming at the dock with these items. Boats and jet skis are available through a local source, at discounted rates. Of course feel free to bring your own boats or watercraft. Kick back and relax in the comfortable main level living room. Watch TV, listen to the stereo, gaze out the beautiful windows to the lake. Enjoy coffee on the covered upper patio. On this level, you will also find Three bedrooms. The master bedroom has a king size bed, all other bedrooms have queen size beds. In addition, 2 of the bedrooms have gorgeous lakefront views. The kids bunk room has full over full bunk beds with a pull out trundle bed. 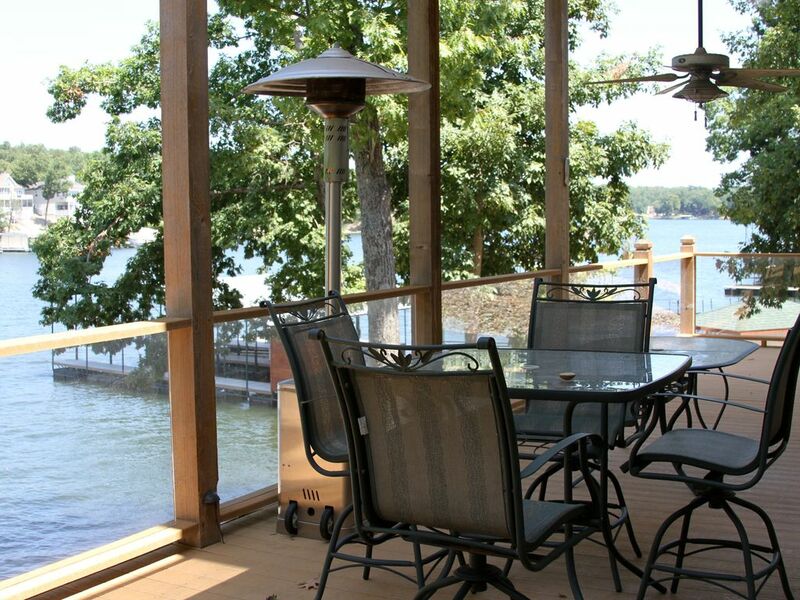 Lake of the Ozarks and 'Thunder Cove' is a true gathering place for your family and friends on your relaxing vacation. Located downstairs, and sure to include many hours of entertainment, is the spacious game room. The game room is complete with a pool table which includes a ping pong, game/card table, darts, sit down bar and utility kitchen. Just off the game room is a large deck with a ceiling fan, to enjoy all those lovely spring and summer evenings. If it gets a little cool, light up the fire on the lower patio or the propane heater on the lower deck. After a long, exhausting day of swimming, boating, fishing, or shopping, you can relax on the deck or dock under the Ozark stars. When finished, gather around the warmth of the blazing lakefront fire pit to roast marshmallows or possibly enjoy the sweet taste of s'mores. It doesn't get any better than that??? Great week at the lake. We had a great time . The dock worked out great for us and the 2 seadoos. All of us had a blast on the slide and the diving platform.I was surprised how many enjoyed the floating rock climbing mountain.Charlie was very easy to work with and everything was just as they said it would be. We received our deposit back in a very timely manner. It is a great location on the water and it was nice having the marina next door for ice and gas. We were a little worried that it might be too busy but that was not the case at all. I should mention the finished basement with the ping pong table. The kids loved it. There were some pretty heated games. We would definitely go back and stay again. Thanks Steve! It was a pleasure to have you and your family as our guests at the Lake. Thank you for taking excellent care of everything! We look forward to having your family back soon!! This property was as described in the listing. It slept 13 comfortably, 6 adults and 7 children. The kitchen, appliances, washer and dryer were all in good working order and clean. There are plenty of cooking supplies and dinner ware. (We used the plastic cups so we could go outside or on the boat). The decks are incredible, especially the top deck which is covered and provided some shade in the daytime, then beautiful sunsets at dusk. We were a little worried about the roughness of the water as we had been told that the Lake of the Ozarks can be very choppy, but this house is perfectly located near the end of a long cove that was wonderful for swimming, boating and tubing. The deck was a ton of fun for the kids. There is a nice flotation "circle" a little ways out that the adults enjoyed relaxing within. Nearby the location were some nice restaurants an convenience stores. We tended to make our own meals or take our rented boat (Adventure) to one of many close by restaurants on the lake. The owner is responsive and easy to work with. We were very happy to be able to share our home with your family and look forward to having you back on a future vacation! Thanks again! (((All reservations are subject to $150.00 cleaning fee and $500 security deposit.))) Reservation dates will not be held until $500 security deposit has been received. Check-in is 4:00 PM and Check-out is 10:00 AM. 15% rate increase during the week/weekend of a of a holiday. Minimum age to rent is 25.